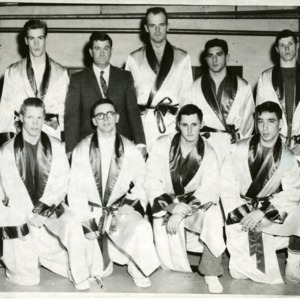 Photograph of the 1963 Wrestling team members. First Row: John Bower, John Cain, Harry Comins, Ralph Strong. Second Row: Bernie Wentz, Coach Norton, Forest Corey, Barton Biondolillo, Wm. Bower. “Wrestling 12,” Paul Smith's College Historical Photographs, accessed April 22, 2019, http://archivesphotos.paulsmiths.edu/items/show/4586.